Industry executives and professionals are uneasy about the recent escalation of international trade tensions and increasing tariffs. Concerns about trade protectionism top the list of industry worries, but only 11 percent of survey respondents say they are extremely concerned about an economic slowdown. 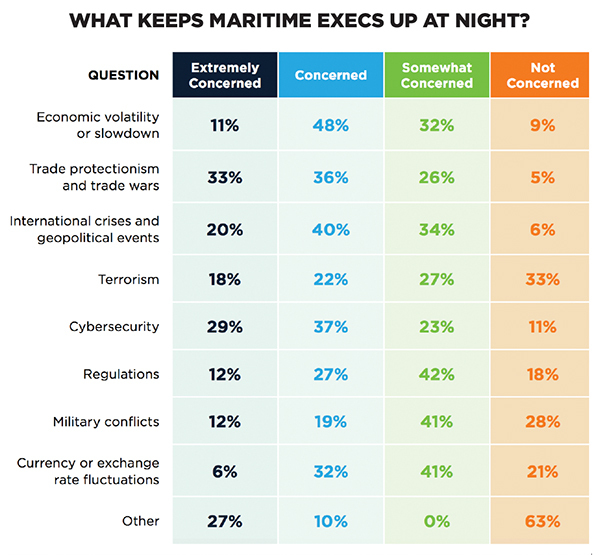 The global maritime industry is cautiously optimistic about the global business environment for world trade, but also concerned about the potential impact of trade tensions, cyber security, fuel costs, and other headwinds to industry recovery. Those are the findings of a new benchmark survey developed by the Business Performance Innovation Network, in partnership with Navis. Some 82 percent of survey participants anticipate either improved profitability over the next 12 months, or continued stabilization and reduced losses, according to the Navis Business Bellwether report. Growth is expected to come from all regions of the world, with particularly robust activity in Asia and the Middle East/Africa. While just 12 percent of respondents are "very optimistic" about the global business environment, another 46 percent express cautious optimism. Some 41 percent say they are either somewhat or very concerned.